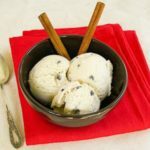 A recipe for homemade cinnamon chocolate chip ice cream - a delicious frozen treat to be enjoyed at any occasion. In a medium bowl, whisk together sugar, eggs, and egg yolk until lighter in color. In a saucepan over medium heat, bring the half-and-half, whipping cream and cinnamon to 160 degrees F. Remove from the heat. Use a ladel to add a little of the cream to the eggs/sugar and whisk to combine. Continue adding cream until at least half has been mixed with the eggs. Add the eggs/cream mixture back to the pan and whisk to combine. Over medium heat, cook the mixture until it reaches 170 to 175 degrees F, stirring constantly. Pour the mixture through a sieve or strainer into a medium bowl. Add the vanilla and stir to combine. Cover the mixture directly on top with plastic wrap to prevent a skin from forming. Cool to room temperature. Once it has cooled, place it in the refrigerator to chill overnight. Pour chilled mixture into an ice cream maker and freeze according to the manufacturer's instructions. Stir in the chocolate chips. Transfer ice cream to a container and place it in the freezer for at least one hour or overnight. Enjoy!